Finding time to be alone can be SO HARD—partly because we don’t really want to have a chance to think about everything we haven’t done yet, and partly because we’ve told the world we’re available. I remember when cell phones first came out. I said, “Who would want to be on call 24/7?” I had this crazy idea that human beings need opportunities to remember who they are and what they value most. Then I bought a cell phone like everybody else. 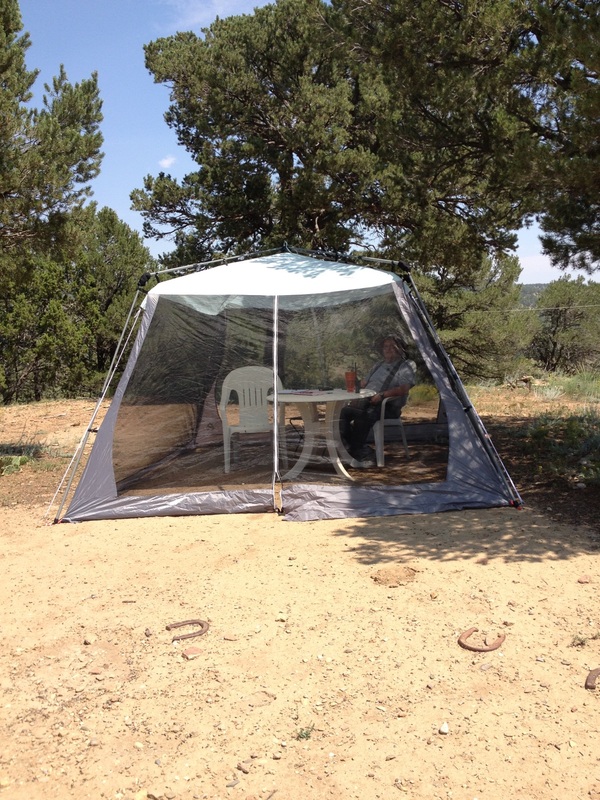 Early this spring, I had a brilliant idea that I would like to have a screened-in room where I could be close to nature without being bitten by nature’s little nasties—a place where I could leave my cell phone behind and sip wine or coffee…or water, in a pinch. My first choice was to create a screened-in porch, but our hummingbird population had claimed the covered portion of our deck where screening could be installed—if one were inclined to work that hard. My husband bought me a little tent/room for Mother’s Day. Then the rains came. I’m not complaining, because our area didn’t receive the deluges that created flash floods. However, we did receive rain and sometimes hail and often wind nearly every day. Putting up a light screened-in room with two flimsy zipper openings didn’t look like a good idea—especially when we were going to host a collection of grandchildren who have trouble doing anything gently. We decided to wait a while. Tick, tick, tick. We set up some yard furniture in the screenhouse and hurried in to relax. We should have paid better attention to the bunnies and squirrels and chipmunks who looked on our achievement with horror. A screenhouse is not nature. Even with wine, my husband and I didn’t exactly relax. A screenhouse holds whatever you bring in. The next morning after our walk, my husband and I took our coffee to our screenhouse. Morning is by design a time when we prefer to move slowly. We meditated. We sipped coffee. We listened to the birds and angry chipmunks and the nearby methane well pumps. Ahh. This entry was posted on August 23, 2015 by Personal Journeys with Gramma in Life Stories and tagged Alone Time, Cone of Silence, featured, Listening to Inner Selves, One with Nature, Personal Reflection, Personal Space, Personal Time, Private Space, Quiet Reflection, Remembering to Relax.